Nice weather at start and threatening to get real hot again. I met a lot of cyclists coming up as I was going down (make sense) and guess not many had been up there much earlier this day than the ones I met. The guy at the place I stayed at had told me that I was lucky because the day before the road had been blocked both above Bayasse and below Bayasse, so I would have had to stay there or I would not have been able to cross over the pass, but they had just cleared it up in the day before I arrived there (and I had seen a lot of dirt and some stones on the road). 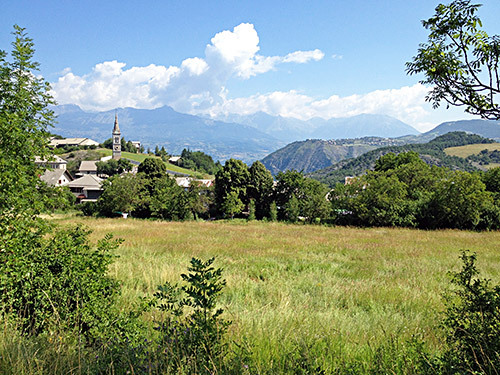 I did not go into Barcelonnette and instead took the D109 on the south side of the Ubaye river down to Les Thuiles (1100m) on the main road on the other side of the river. (This little road climbed a bit before going down again, which I had not noted when looking at the map.) There were no obvious place to stop at in Les Thuiles for something to drink and eat, so I continued until Le Lauzet-Ubaye (906m), which was where I had planned to start from the day before, so now I was one day behind schedule. I found an expensive little grocery, but at least got something to drink and eat. 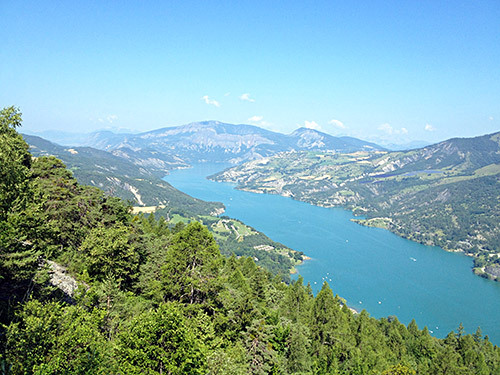 A little later I came to the Lac de Serre-Ponçon where one road descends quickly to a bridge over to the other side and one road climbs quickly up on the south side of this huge dam. 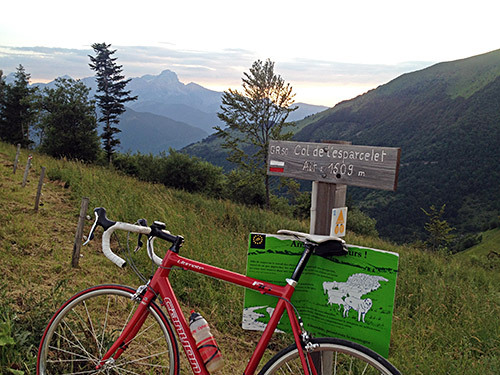 The photo here is near the high point (1139m) at the turn-off for Digne-les-Bains and the Route Napoleon to Nice. Then the road ahead goes a little up and down and from a little pass (Le Collet (991m)) the road descends via La Bréole (in the photo here) to a bridge over the river below the dam building for Lac de Serre-Ponçon. Then I followed the main road westwards. Not so far down the road just before Remollon, the first real climb of the day at last started. It was already quite hot outside now. I thought I found a reason to stop shortly in Théus for something to drink, but there were nothing open here (as I got told by a lady as I thought maybe she had a shop inside, but that was apparently long ago). 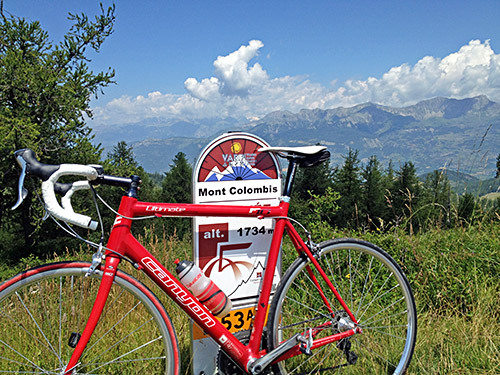 I continued up the now quite steep road and this climb to Mont Colombis (1735m). 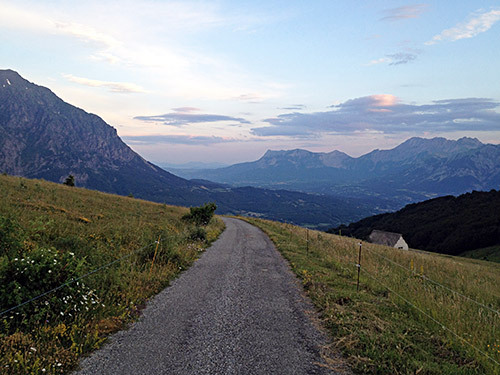 This is among the harder climbs in France with 9.7% on average for 11.35 km for a height gain of 1091m. 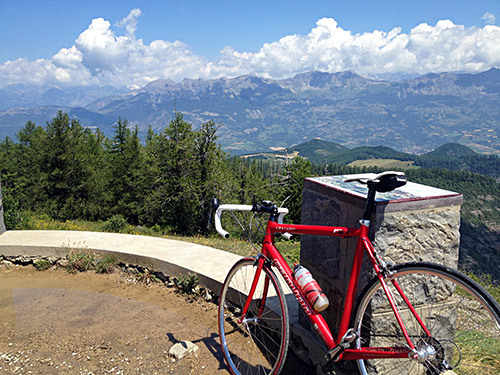 A climb that gives you really rewarding views in nice weather, like this day. The middle section of the climb is easier. I met a cyclist coming down who just had a flat as I was coming by and asked if I could help him, but he apparently had all he needed to fix it. Higher up in this part one comes to the ‘Salle du Bal des Demoiselles Coiffées’ (Ballroom of the topped damsels), which are “earth pyramids”. They are uncommon, but exists in several places in the Alps as I have noticed over the years of travel. 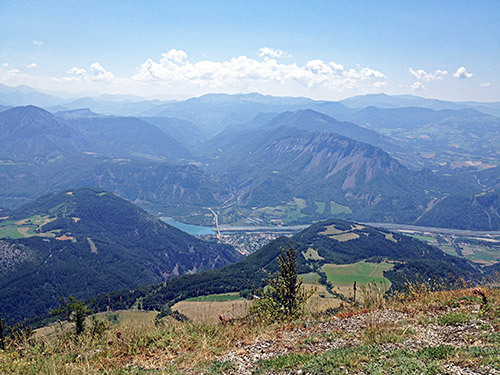 They are the main attraction for people going up here, but some also continues to the peak for the great views over the Serre-Ponçon sea and surrounding areas. 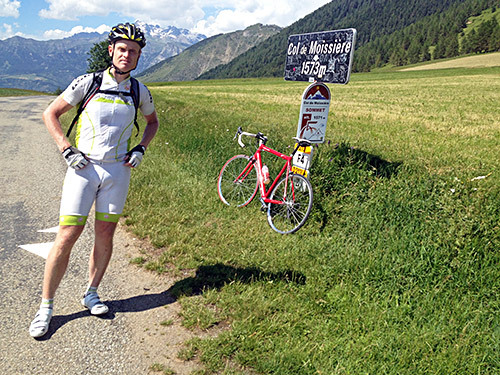 The last three kilometres are the steepest at over 11% on average. Here in the photo you see the bridge below that I was coming over a little earlier. 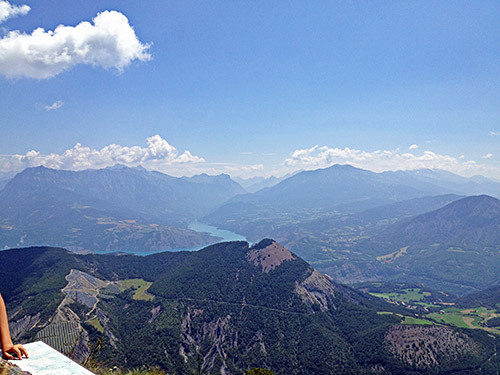 Another photo over the southern part of the Serre-Ponçon and the Ubaye valley I had come down through this morning. The obligatory photo of the sign here. And here a photo of the ‘Salle du Bal des Demoiselles Coiffées’. One cannot see too clearly in this photo the many peaks of earth with something that looks like a big stone on the top of each (hence the idea that they look like heads). I went down and then stopped at the bar in Remollon and thought about lunch, but it was so hot I did not feel like eating, but they had Belgian Leffe (Blond) beer on tap, so I had one such before I went on. 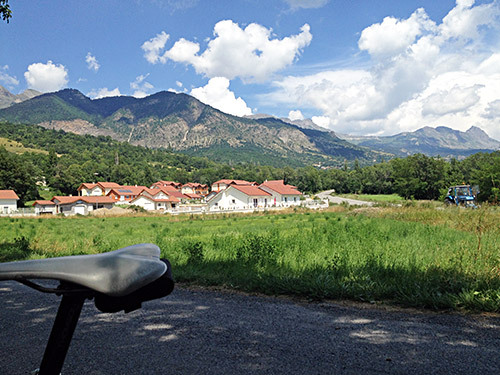 I missed the next turn-off to the right, but turned around and took a minor road to Valserres (671m) from where the road goes north. Then took a minor road up to La Bâtie-Neuve (857m). At this point I just got totally exhausted. Maybe the beer was not what I needed after all or it was a combination of the heat and all the days of cycling. 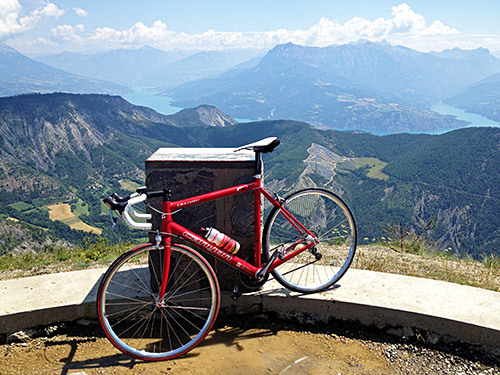 I saw a park bench just at the start of the climb up Col de Moissière (1571m) and just sat down to rest and took the photo here. The only time I stopped only for resting. Never complain about sunny weather, but sometimes it can be tough with a constant 38 degrees. After resting like 20 minutes, I decided I should get going again. The next climb is also a quite hard climb by French standards with over 10% on average for the last 3 km, but I decided to take it very easy up. Never have I climbed a pass this slow (with similar inclination). I was feeling a tired all along and no better at the top. An old nice man came over and offered to take a photo of me and I had to accept his generosity even though I felt like a real loser here. It is also quite lovely up here at the pass. The air was easier to breath up here. Now I headed down to Ancelle and had to go around here for a while before I found a place to fill up water near a church. 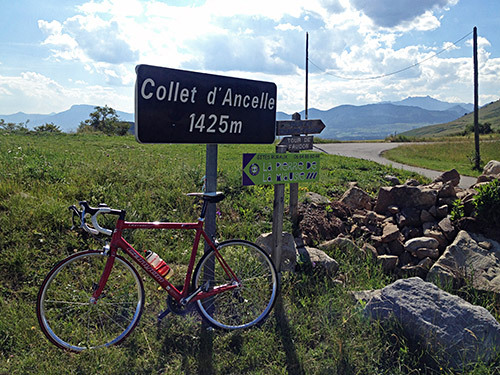 Then a short climb up to Collet d’Ancelle (1427m) – time for some pass collecting, which is easy in France where there is never far to the next little pass. And here the pass sign. 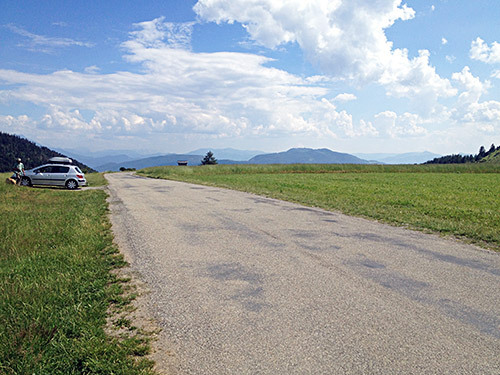 There is a tiny asphalt road down the other side to Manse Vieille, where I took an even narrower short-cut road to the area of Col de Manse (1268m). 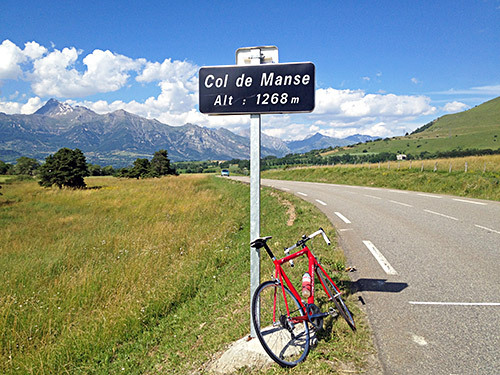 I had to go back 200m on the main road to get a photo of the Col de Manse pass sign. 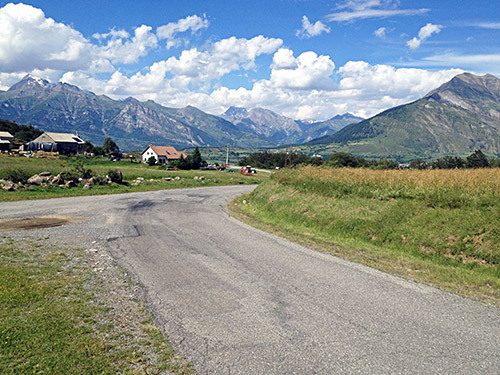 Almost smashed up with a car when turning around here and then headed down north again via Pont St. Julien (1030m) to St. Bonnet-en-Champsur (1024m) Where I stopped for the night one year. Now I stopped for sandwich and a 1.5 litre coca-cola. That should last me through the day. 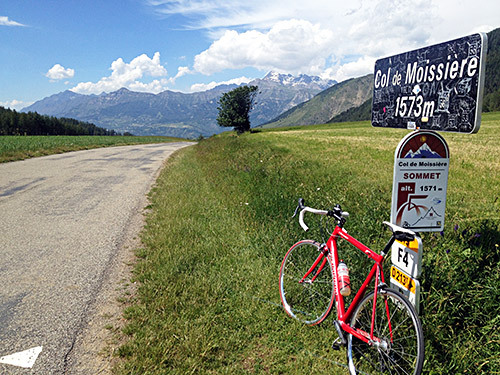 Shortly after St. Bonnet-en-Champsur I went up on a minor road to collect yet another pass – Col d’Aourious (1205m) and another unnamed little pass called Le Gourjou (1252m) (sign 1260m). (Col de la Blache higher up on this ridge should be easy to reach too on a short gravel road from Les Infournas.) 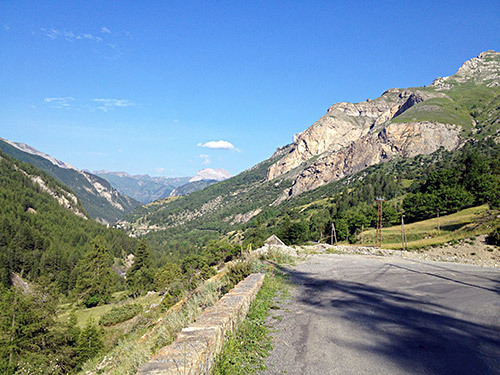 Nice views up the valley from La Motte-en-Champsaur in the photo here. 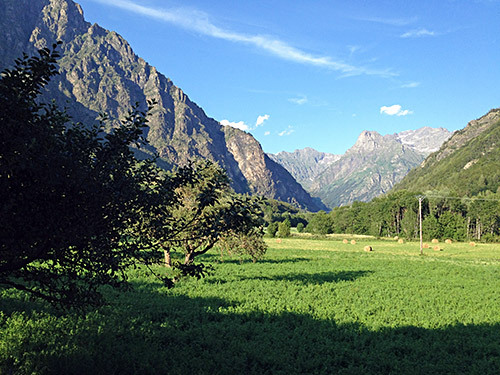 Then shortly before getting down to the main road Route Napoléon from Gap to Grenoble, I turned up to Les Blachus, where I had very nice views again up the Valgaudemar valley. 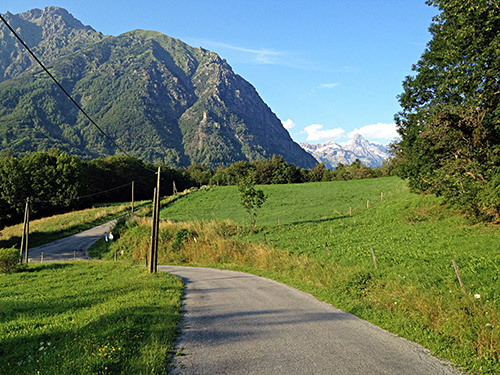 Then down a small road slightly hard to find to Pont de Lallée (840m) and up through St. Firmin, where I thought it was still a bit too early to stop for the day and now I felt much better. 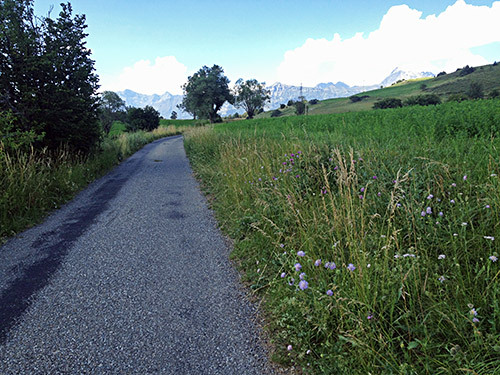 At Col des Festreaux (1106m) I turned up a small road to search for yet another of those +1500m asphalted passes in the Alps not yet visited by me. I didn’t look on my map and was unsure about a road going up after Les Préaux, so I continued to the end of the road at L’Esparcelet, where I found water and asked if it was the road I just had passed by to the Col de l’Esparcelet (1509m), which it of course was. 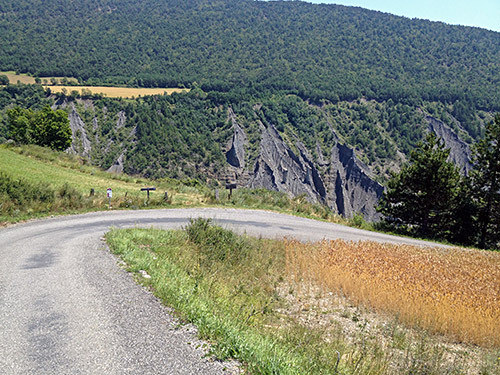 An even smaller road goes to the Col de l’Esparcelet where the asphalt road ends. I went in just a little bit to the very visible on a flat gravel road to Col des Préaux/Prés Hauts (1478m) to feel that I could claim having visited it, but did not want to go to the pass as some people were hanging out there and also nothing extra to see there. Then I hurried down and took a few last photos as the twilight was descending. 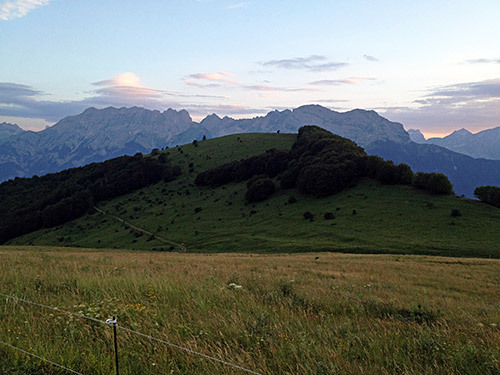 I was hoping to find a place to stay at before Corps and also did find an auberge in Aspres-lès-Corps (975m) just before it got dark, where it seemed like I was the only visitor, which felt strange as all earlier places in France had been fully occupied everywhere. This place was quite good and the price was also reasonable. Very well located off the main road and nice views from here.